Weather +6c, Spits of rain early on, sunny spells later. 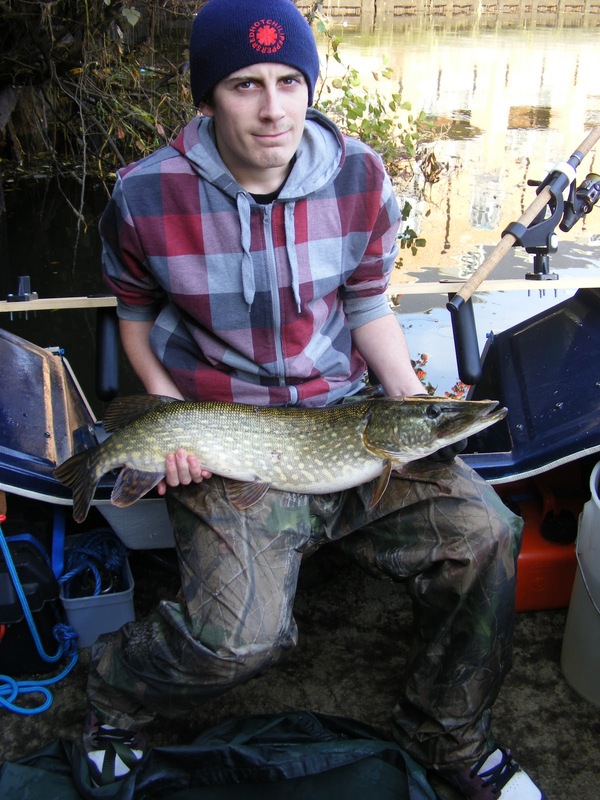 Today my son Dean is out with me for only his third Pike trip and looking forward to the days fishing after seeing the pics from my last outing. The boat is loaded and we head into the city, turning basin area, as i think this will be a fairly reliable and comfortable place to start. 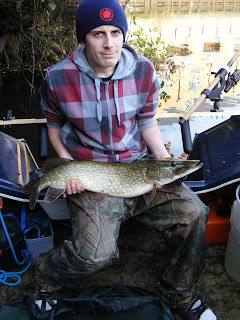 As Dean is new to Pike fishing i explain everything im doing and more importantly why. I set him up just one rod to start with so he can concentrate all his efforts on the single rod. Once he is settled i set up and position 2 more rods which i will watch allowing us to both "Share" the middle rod. As we sit waiting i explain what we need to do when we get a fish into the boat. The unhooking mat, tools, net etc. is all ready. Just as im wondering if we are going to put all this stuff to use, deans float dips and starts to run sideways. He picks up the rod, waits for the braid to tighten, then leans into the fish. The rod hoops over but after a few seconds its off ! We quickly re bait and position the bait back into the same area. Within 5 minutes its away again, this time the strike is met with something pulling back. After what seemed like 10 minutes but was probably only 2, i net a decent fish and quickly show how to handle and remove the hooks. Ive been using some Partridge Double hooks on some of my rigs,size 2. With just the one large Barbless hook, its removed as easy as unhooking a 6oz Perch... We rest the fish in the net over the side while i get the scales and camera ready. When it comes back in its a bit lively again but we quickly weigh it and record 10lb 2oz. Obviously a PB for Dean as he had only caught a few jacks before. I then show him how to hold the fish and get a few pics before slipping her back. Within 15 minutes i get a run on my rod but as Deans first fish, its only briefly hooked. This one did not come back for afters ! Its about half 12 by now and i suggest a move down to the Bridge swim which takes only 10 mins. We are quickly set up and the kettle goes on. The "kettle trick" had brought us the first fish of the day so i thought i would try it again. It takes a little longer than usual this time, but at 1:15pm i get a good positive take and run which results in a 7lb fish in the net. Just fifteen minutes later Deans rod shows signs again but even after waiting just a bit longer, another smallish fish slips the hook. We both change the baits and try different areas and at 1:55pm again Deans rod is taken. He waits until the braid tightens and once again leans in. The rod takes on a nice healthy curve and this time the reel drag is "singing" . I quickly get the other rods out of the way while trying to offer advice to Dean as he hangs on. Even he says "this feels big" after 2 more short sharp runs, the clutch doing its job perfectly its in and around the back of the boat/outboard. As he steers it away from the motor the fish tears off towards mid river and bang !!!! its gone. "Its broke" Dean says. It cant have broke i say, its 40lb braid with a 35lb titanium wire trace. As he retrieves the rig, the float then up trace comes into view, but no hook ! The wire has broken about one inch up from the hook, a clean break leaving about 14 inches of the remaining hook link. I am mortified ! I check the other crimped end and it all looks fine. If it had slipped out of the crimp i would have probably felt even worse, but the wire had broken for no apparent reason. This is the first time ive been let down by equipment failure like this unfortunately for Dean,its probably cost him a second PB in one day. We decide to pack up and head back, both wondering just how big it might have been. On the plus side, i think ive "hooked" another angler and the next trip cant come soon enough for Dean. On returning home i laid out and checked every hook trace in my rig wallet. Everything looks spot on but i will now check the traces even more regularly from now on.